For those who have grown up in the Boston area, deciding to go for a swim in the Charles River would historically elicit a brow-furrowing response of confusion. “‘Ew you’re disgusting — you’re crazy!’” Tamara Lawrence of Roxbury said, imagining telling her friends about such a scenario. 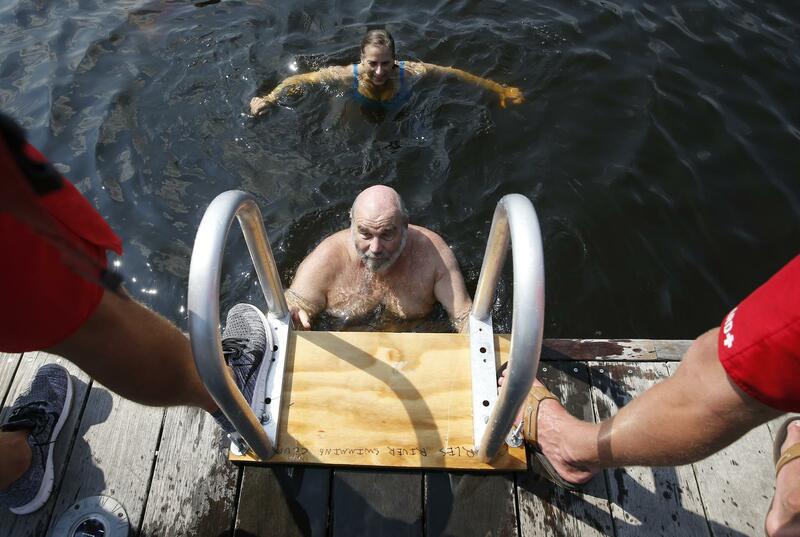 But Tuesday afternoon, the prospect of swimming in the Charles seemed neither disgusting nor crazy, as dozens of swimmers gathered at Fiedler Dock near the Esplanade to take their turn doing what, most days, is not an option: plunge into the Charles for a swim. “It’s heavenly!” one woman popped above the surface to shout, splashing around with about 40 other swimmers. 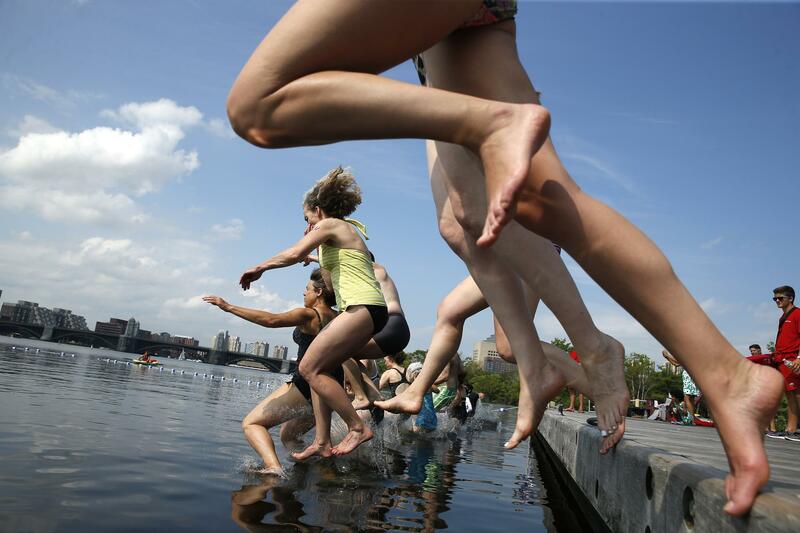 Hosted by the Charles River Conservancy, City Splash is an annual chance to spend the afternoon in the Charles. Swimmers reserved a spot between 2:30 and 6:30 p.m. for $10, which granted them a 25-minute foray into the water. “It’s really quite a magical story, because most urban rivers have really struggled and gotten worse, and we haven’t paid any attention to keeping them clean,” said Paul Parravano, an Arlington resident who had just climbed out of the river, using his midday work break at MIT for a swim. “It’s not clean every day, but it’s such a dramatic turnaround from what it was 20 years ago, when we started talking about doing this,” Parravano said. 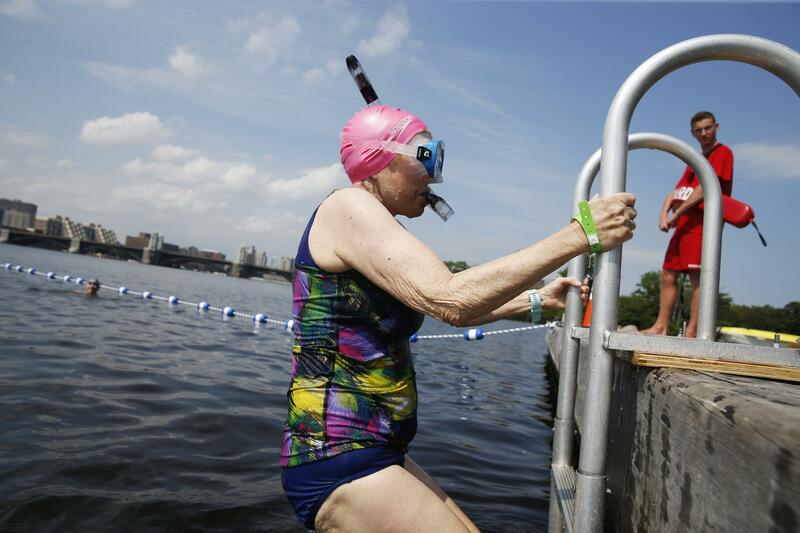 The first City Splash, in 2013, was one of the first public community swims in the Charles since beaches were shut down more than 50 years ago because of health risks caused by industrial activity along the river. And as Parravano recalled, making the Charles swimmable has been years in the making. In 1995, the EPA launched an effort to make the Charles safe for swimming, but with a grade of “D,” it had a long way to go. As of last week, the river has been given a “B” by the Environmental Protection Agency. Though swimming in the Charles isn’t usually permitted, SJ Port, director of development and communications with the conservancy, said the river was tested and the event received a special permit from the Department of Conservation and Recreation, also working with the Massachusetts Water Resources Authority and the Department of Public Health. “Unless you really engage with your water, and your parks, you don’t appreciate how much they bring to the community,” Port said. Throughout the five years of City Splash, Port has noticed that all sorts of swimmers come out to the event. Some have come every year, swim caps and goggles in tow. For others, finding the event was an accident as they stumbled upon it during their run along the river. “The 2:30 slots — those are the diehards,” Port said, referring to the visitors who were the first ones sunscreened and lined up along the dock, ready for the river. Port said most people leave the event wishing this was something they could do more often. And perhaps that day isn’t too far off. City Splash gives locals a taste for what could come in the future with the Swim Park Project, an initiative put forth by the conservancy to build a permanent swimming facility in the Charles River at North Point Park. According to a recent study by Stantec, an engineering services company, this sort of complex is feasible with “further study and due diligence,” according to a statement. “Everybody ought to have that opportunity,” he said. Kiana Cole can be reached at kiana.cole@globe.com. Follow her on Twitter @kianamcole.